“Despite the efforts of newly-minted liberal Democrat Angus King, the American people have a ninth Supreme Court Justice who will protect the Constitution and the rights of the American people. “I would also like to commend Senator Susan Collins for her thoughtful support of Judge Gorsuch and her steadfast opposition to Senator Schumer’s filibuster. “I am beyond pleased with the actions of the Senate in this past week. 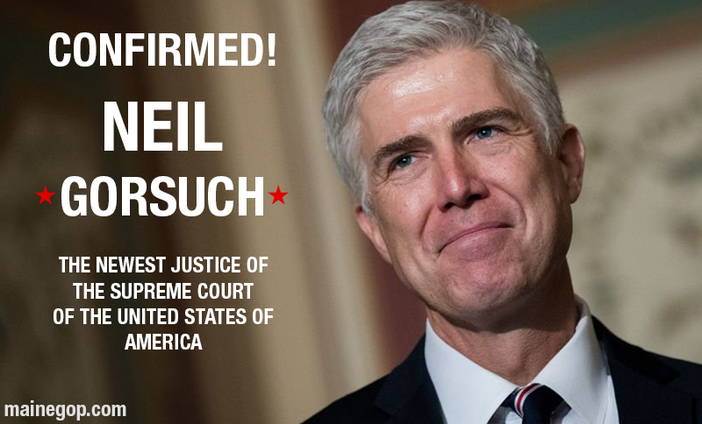 Judge Neil Gorsuch is a highly qualified individual who will uphold the law while respecting and defending the Constitution. Today, we saw a successful effort to maintain the integrity of the U.S. Senate and proof that extreme liberals cannot bully Americans and our government.